Gather at 10:30 a.m. on Saturday, June 24, 2017. The ride leaves at 11:00 a.m. If you arrive early, Velofix will be on-site performing light tune-ups. We’ll also be giving away commemorative items! The Crossroads of the Danforth, Danforth Avenue & Danforth Road. 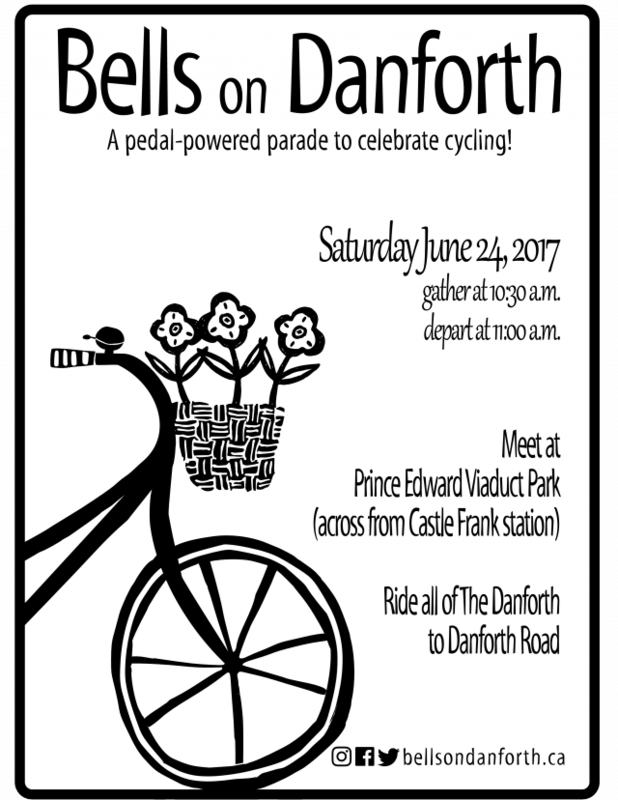 Toronto East Cyclists and Crossroads of the Danforth BIA will be throwing us a party when we arrive. Hang out, visit one of the local restaurants with a coupon, or sit for a picnic lunch in the nearby park. This year, you’ll be able to follow the ride on Glympse (IOS, Android), so you’ll know exactly where we are if you plan to join in along the way. An escorted return ride west will leave the party at 1:30 p.m. sharp. The official route will return along Danforth Avenue to Broadview. Riders may leave the main group with a ding and a wave as they approach their destinations. More details will be announced before the start of the ride and at the Crossroads the ride is over. If you don’t want to take the escorted ride back, we’ll have a limited number of printed return maps available showing you how to get to Victoria Park subway station or the Don Valley trail system via quiet residential streets. Both routes are shown on the map above. If you need more information, ask one of the ride marshals or send us an email.